"I don't necessarily think I should change the way I cook for the people I'm cooking for. Cowboys are cowboys. I'm not cooking for the cowboys, though. When a guest comes into your restaurant, you don't create a menu based on where they come from. You cook your food and they either like it or they don't." I don't entirely disagree. The way he cooks is his personal style. He shouldn't change that for anyone, because that's what makes him unique. However, these cowboys aren't coming to his restaurant. This challenge is more like a catered event where the chef is indeed working for the people he's cooking for. He may not need to change his cooking style, but he does need to change his attitude. After all, this is a competition. The judges want to know who can best execute the spirit of the challenge: cooking over open campfires in the desert for ranchers who work hard all day. 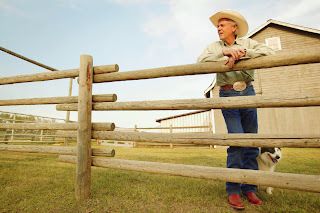 Does the food taste good and also suit the needs of the ranchers? The show wouldn't devise such challenges if the chefs were going to be allowed to cook whatever they wanted in every challenge, with the perfect ingredients and the comforts of their home kitchens. They do that every day in their own restaurants. The judges are asking the contestants to open their minds, stretch their imaginations and abilities, and push themselves beyond what is comfortable. If they can achieve this and still make good food, they will succeed on the show. Speakers face the same challenges, although not artificially created by a judging panel. Every speaking event is a chance to expand our efforts, to try new things and to find new and better ways to engage the audience and serve their needs. The more we stretch, the more we explore what makes our presentations successful with different audiences, the more success we will achieve.